The French bill could mean a possible prison sentence for people who force women to wear full face veils. Paris, France (CNN) -- The French Council of Ministers approved a measure Wednesday to ban the wearing of full-face veils, sending the bill to parliament. 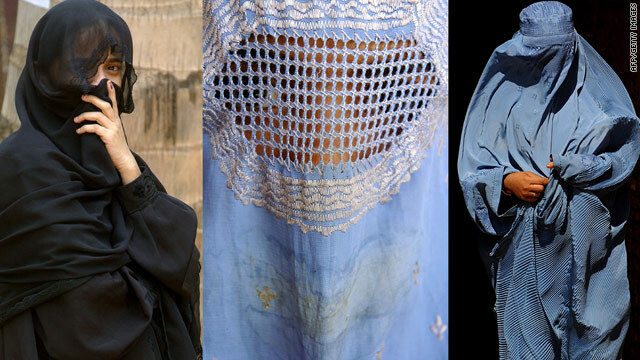 Veils that cover the face "cannot be tolerated in any public place," said a statement issued by the council. The Council of Ministers' approval of the bill is the latest step in France's efforts to ban the burqa, niqab and other Muslim garments that cover a woman's face. Justice Minister Michele Alliot-Marie introduced the measure in the council Wednesday. A panel of French lawmakers recommended a ban last year, and last week lawmakers unanimously passed a non-binding resolution calling the full-face veil contrary to the laws of the nation. "Given the damage it produces on those rules which allow the life in community, ensure the dignity of the person and equality between sexes, this practice, even if it is voluntary, cannot be tolerated in any public place," the French government said Wednesday. The measure would take effect six months after passage, giving authorities time to try to persuade women who veil themselves voluntarily to stop. The bill is not likely to be voted on before July in the National Assembly -- the lower house of parliament -- before it moves to the Senate in September. The French Council of State has warned that the ban could be incompatible with international human rights law and the country's own constitution. The council advises on laws, but the government is not required to follow its recommendations. Amnesty International Wednesday urged French lawmakers not to approve the ban. "A complete ban on the covering of the face would violate the rights to freedom of expression and religion of those women who wear the burqa or the niqab in public as an expression of their identity or beliefs," said John Dalhuisen, Amnesty International's expert on discrimination in Europe. Belgium's lower house of parliament passed a similar ban in April. If that bill is approved by the upper house and signed into law, it will be the first national ban in Europe on the burqa, a full-body cover that includes a mesh over the face, and the niqab, a full-face veil that leaves an opening only for the eyes. The Pew Forum on Religion & Public Life estimates that France has about 3.5 million Muslims, or about 6 percent of the population. France does not keep its own statistics on religious affiliation of the population, in keeping with its laws requiring the state to be strictly secular.